A radiator fan is one of the most important components inside your ATX case. To maintain a proper airflow inside your cabinet, you must use only the best-rated radiator fans. In this detailed post, we have covered the best radiator fans for liquid cooling so that your PC is never on fire. Our team reviewed nearly 27 different radiator fans of different sizes and brands. In the end, we have prepared the list of top 10 radiator fans that would add power to your PC. The list includes 120mm, 140mm, and 200mm fans. You can choose the fan depending on your sizing requirements. Comparing radiator fans can lead to a lot of confusion especially when you have no idea about technical specifications or fan aerodynamics. The fan needs to support liquid cooling as well as produce as little noise as possible. Though, there are various other features that you need to consider apart from airflow and decibel ratings of the radiator fans. We have covered that all in the buyers guide at the end of the post. For now, let’s dive and check the detailed review of the top 10 radiator fans available in the market. 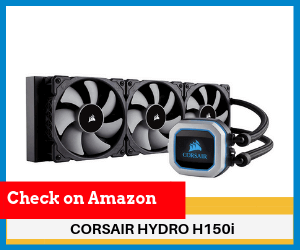 The CORSAIR Hydro Series H150i PRO is a beautiful all-in-one RGB liquid CPU cooler with a 360mm radiator built for low-noise cooling and dauntless styling with an RGB LED pump head. The radiator fan has got a premium design. There are no unnecessary RGB lights. Corsair has decided to keep it clean and hence it looks premium. There is just one scintillating RGB LED pump head that produces some striking lighting effects to match the build. This monster is also powered by magnetic levitation. There are three 120mm PWM fans provided which work on magnetic levitation engines. It is clearly designed for silent operation and good airflow. The fans produce just a mere 25 dB of sound while operating at the fullest. There are 3 low-noise 120mm of ML Series magnetic levitation PWM fans that deliver incredible airflow and produce just 25 dB of noise at full speed. CORSAIR iCue is a mighty software that allows you to adjust the RGB lighting quite easily including the individual fan speeds, and pump speed while monitoring CPU and coolant temperatures. 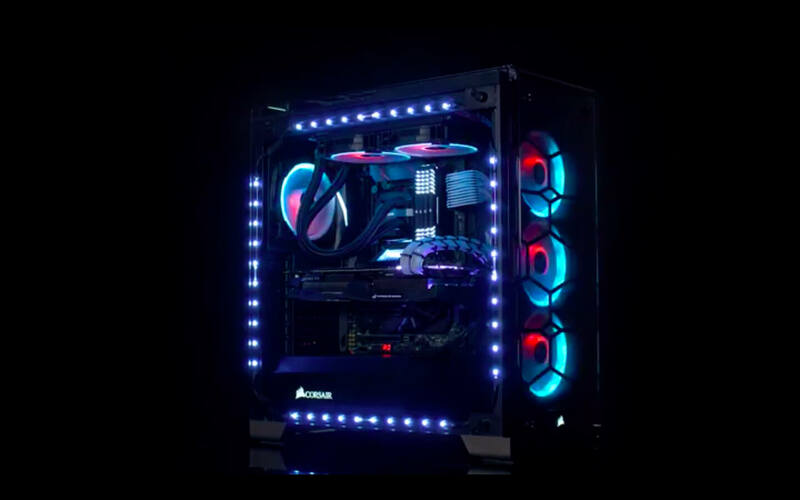 The CORSAIR iCue software is supported by the Zero RPM cooling profile which allows the fans to stop entirely at low temperatures, eliminating fan noise. Modular, tool-free mounting bracket for swift installation on most CPU sockets. Corsair has computer radiator fans for all price segments. Corsair keeps all kinds of customers in mind and tries to fulfill all their needs for different budgets. 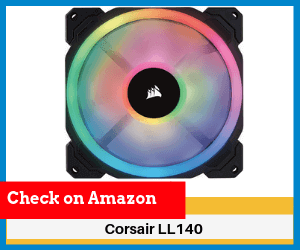 This product is more budget oriented as it is cheaper than the other Corsair fans we have already listed above. This product is a highly economical option with some great specifications. It melds efficacious high-pressure airflow with eye-catching LED lighting. It affirms less noise and turbulence than mediocre fans. It has high pressure cooling paired with LED radiance. It has slightly better performance than the standard fans provided at this price. The fans are LED lit and look astonishing. Corsair has particularly built the fan blades in such a way that there is less turbulence and noise. This product is available in many colour options. This is the most superior radiator fan of this price segment. The LED lights on this fan are fantastic and even the fan blades look marvellous as they are translucent and frost textured. As already mentioned as one of the features, the motor blades are crafted in such a way that they create minimal or no turbulence and noise. The quality is not cheap at all. This is the best build you will get for the price. Corsair provides 2-year warranty with the product. The fans are listed as they provide 1650 RPM but out of the box, they only provide 1500 RPM. The difference isn’t much but it would still bother some of the buyers. 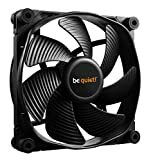 Be Quiet is a renowned brand and the fan Silent Wings 3 made by the company offers great power with limited noise and power consumption. It has ameliorated surface structure on the fan blades. This helps with excellent airflow. There certainly are other brands in the market you can opt for but be quiet! Silent Wings 3 is a perfect alternative for other silent fans. They are nearly silent at low speed and bearable at high speeds. They cannot be compared to the Noctua fans but they are definitely worth a shot. The best thing about choosing this product over others would be that it consumes very less power and is also silent. The only drawback you would find would be that these do not come with any kind of RGB LED lights. It is a 120MM PWM model. It produces noise of 28.6 dB. It rotates at 2200 RPM. Has modified, special texture fan blades which improve airflow and static pressure. It has rubberised fan frame. They are essentially silent and if the fan speeds up then also the noise produced is bearable. The power consumption of this product is negligible as it saves a lot of energy. Despite working so efficiently, the Silent Wings 3 does not miss out on performance. It still offers great great performance. The Silent Wings 3 is economical too. The price is agreeable if compared to other devices in this price bracket. It looks classy and the fan blades are also textured so it adds up to the overall look of the fan. This radiator fan does not come with any kind of RGB LED lighting. This is something different. This is not just a radiator fan. It’s a complete package and it serves us 3 RGB fans, 2 RGB LED strips and a remote to control the lighting effects. The whole bundle is easy to install too. The overall look of the fans and RGB LED lights is great and quite colorful. Talking about the performance, altogether the fans are pretty silent and powerful. Performance is not compromised at all and the fans also look great so it definitely is a complete bundle. The pricing is also totally amenable. The contents provided in the bundle are absolutely worth the money. Also, the quality of the contents provided is amazing and does not look cheap at all. It surely is the perfect collection of products. The radiator fan speed is 1000-1300 RPM. The sound generated is of 23.5 dB. It is has a wide carousel of colours to choose from. The fan is of 120mm. 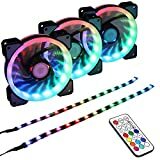 The bundle includes mainly 3 RGB fans, 2 RGB LED srips and a remote control to manage the illuminating effects. The product pricing is the major reason why we or anyone else would like this product. It offers so much in such reduced price that everyone would definitely love it. The radiator fans have a sleek body and look great. The RGB lighting effects are delightful. The colors produced are vivid and totally brilliant. No compromise has been made on the performance sector as the fans give decent performance for the price. A good balance has been maintained between the performance and looks provided in the limited money asked for. The whole bundle is worth buying as it gives great value fot the money paid. Some of the customers found that the product delivered was defective or separate components had some kind of defect in them. This is another Corsair high performer at a decent price. By now you all must have understood which brand easily owns the list of best radiator fans. Corsair clearly shows how it is the winner in making computer cooling fans in not just one or two, but all the price segments. 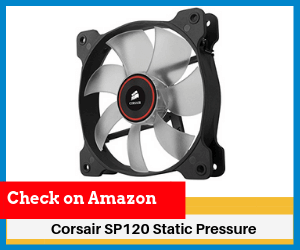 The Corsair Air Series SP120 PWM high performance edition fan has an extensive body and it the blades provide remarkable static pressure and airflow. No, it does not come with RGB LED lights but the box contains three user interchangeable colored rings which can be used to match the fan color with the rest of the cabinet and motherboard components. The fan is not so silent as other fans in this segment. If silent operation is your priority then you should cull this product and prefer Noctua fans over this. Keeping this problem aside, the Corsair Air Series fan is a great choice. The pricing is also fair, it is neither too expensive nor cheap. It has a 4-pin PWM support. It has seven blades in total. Packed with three colour rings to attach to the fan system so that it gives a better look to the overall arrangement. The three colour rings are of RED, Blue and White colour. Has rubberised corners for sound dampening. First and foremost, it gives us a balanced and satisfactory performance and if not compared with other choices then it would be a great buy. It offers high airflow and static pressure and has good quality blades. It does not provide any RGB LED lighting but still appropriates by bundling coloured rings so they add up to the overall looks of the fans. The product is also not too exorbitant, it delivers all the important features at an acceptable price. It does not come with RGB LED lights so it does not go with the trend. 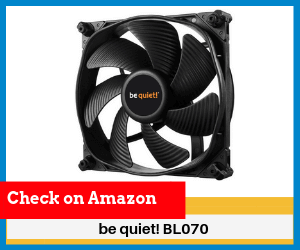 Many customers reported issues of the fan making buzzing or rattling noise when it reached the top speed or near top speed. Another mammoth created by the tech-giant Corsair. This is one of the most beautiful looking PWM fans that you can find for sure. 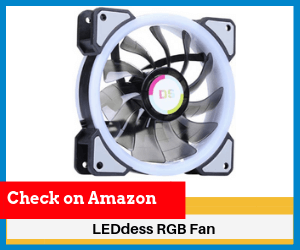 It has 16 brilliant, independent RGB LED lights in every fan which are split between two separate light loops. “Just Glow With The Flow” would be a perfect line to describe the Corsair LL140 RGB radiator fan. This radiator fan uses an optimized 140mm fan blade and PWM control. You can easily set the fan speed anywhere between 600 RPM to 1300 RPM in order to control the noise and airflow adjustment. It is a very good combination of looks and performance and it would be a perfect product if your priority is the overall look of your computer system. The RGB LED lights would definitely go well with your expectations. It has a wide array of some vivid lights that will definitely steal the show. It boasts of 16 autonomous RGB LED lights in each fan which are further split between two light loops and has incessant customization. This product is software controlled so you can alter RGB lighting effects accordingly anytime you please. You have the complete PWM control in your hands. You can vigorously control fan speed from 600 RPM to 1300 RPM. The 140mm fan blades are designed for low noise action. 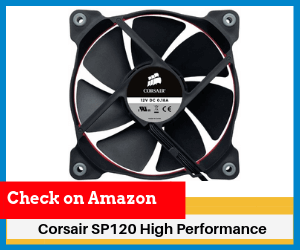 This radiator fan is a show stealer as Corsair is mainly focused on making it look better than the other fans in this range and even in the higher price segment. The RGB LED lights are resplendent on this one. It is a true consonance of lights and colours. The fan blades are engineered in such a way that they create minimal, in fact almost negligible amount of noise. Coming to the basics, it does all the work that it is made for. It offers good performance with great looks. We hoped that the fan should have provided a little more airflow at the given price. NZXT is another brand that would come in our list after Corsair if we are talking about Gaming PC hardware. 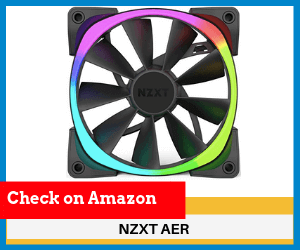 NZXT AER RGB 140mm case fan is a pretty competitive product and offers supremely powerful performance for the price. Filling into the trend, the NZXT AER RGB 140mm Computer case fan also comes with some terrific RGB lights. The pattern of lights and colors can be easily set by the user with the help of the software bundled with this. 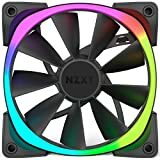 The NZXT AER RGB 140mm Computer case fan has a nine-blade design and it excellently manages airflow. We can say that it is pretty quiet as it produces sound at only 22 dB. These fans are HUE+ and CAM accordant for coherent software controls and modulation. Has a nine blade design and a coloured band of LED lights running around the fringe of the fan. The noise generated by it ranges somewhere between 22 dB and 33 dB which is not loud at all. It is utterly chill and tranquil at the same time. It has florid RGB lights that are downright striking but ultimately gives a good look. The noise produced by it is also negligible and it would not be a much of a problem. NZXT promises nest in-class performance and also a great after sales service as it is a renowned brand. The RGB lights are single sided. There is nothing on the back of the radiator. The wiring system is a bit knotty. It can be hard for some users to set it up by themselves. This is one device that clearly displays great efficiency. It is a massively successful fan. and it surely won’t disappoint you all. Noctua is pretty confident about this product as it gives a 6-year manufacturer warranty. This is an award-winning A-series fan that has a supreme cooling mechanism. It is a classy looking radiator fan but the only shortfall is that it does not have RGB LED lights support. It is definitely well formed but still, people want to have RGB lights in their rigs these days. Performance is one thing that matters the most to most of the people and Noctua surely paid a lot of attention towards the overall performance that this beast provides. The fan is also anomalously quiet. Noctua has clearly put in good sound dampening techniques. 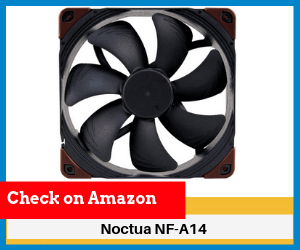 So, if you all expect only splendid performance from the device you have bought, then the Noctua NF-A14 heavy duty cooling fan is the perfect radiator fan for you all. It has a 140mm fan size and SSO2 bearing type. It is a 4-screw heavy duty fan. It has a 800 RPM to 3000 RPM broad speed range. It is IP52 certified water and dust resistant. It is backed by a 6-year manufacturer warranty. This radiator fan has won more than 100 awards and recommendations . It is super silent and is super sophisticated. It offers intense cooling performance. It has a magnificent build quality. The company provides a 6-year warranty with the product. It does not offer a stylish look as it does not go with the trendy RGB lights and all. Firstly, Fractal nailed it with the unprecedented and sturdy build of this device. The design is aerodynamic so that air easily passes through the fans and the noise and turbulence is also curtailed. The design is modified in such a way that it offers splendid performance and looks great at the same time. 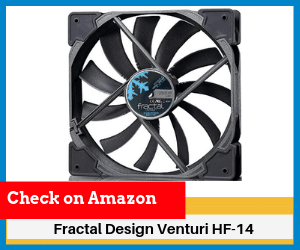 A lot of attention has been paid towards engineering the fan in such a way that it boosts the performance of the fan, surely a smart move by Fractal. This also helps in holding a balance between the extreme airflow and the static pressure. The noise levels are also not too high and are bearable. This fan has a major drawback. It is not a PWM fan so the fan blade speeds cannot be controlled. That’s it! This is the place where this fan loses the game. If we talk about anything other than this, then this product is surely a win-win. Also, there are no RGB LED lights present on or with the package. It is made with high grade glass fibre reinforced thermoplastic polymer. The device is built aerodynamically as a whole. This 140mm fan comes with supplementary sound and vibration dampening corner that also fit into the 120mm fan cases. It has a 3-pin connector. It has a paramount build quality and a marvellous aerodynamic body which helps in keeping the system cooler than ever. The vibrations and turbulence on this has been taken care of by the company. So, it does not vibrate much which further helps in lessening the noise created. The noise produced is also as low as it could be in a budget radiator fan. The appearance of the fan is also outlandish. This device is decently priced. The fan is not a PWM fan and thus you cannot manage its speed. It only comes with a 3-pin connector system. There are no modern day RGB LED lights present. This is the cheapest radiator fan on the list right now. But, it does not mean that this device is weak in performance or lags somewhere as compared to the other devices present on the list. 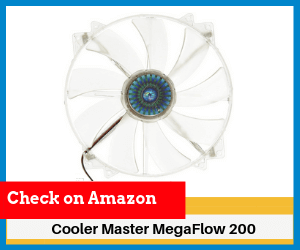 The Cooler Master MegaFlow 200 is the only radiator fan on the list which is sized at 200mm. Bigger fans are the modern day solutions for reducing the heat in a computer system. This 200mm fan works twice as much as a 140mm fan. Also, this is by far the most silent radiator fan that you can buy, it is cheap at the same time. It produces just 19 dB noise. If we talk about the performance and compare its performance with the other fans on this list then this device will not emerge as a winner. Considering the price of this silent gargantuan, it is definitely worth buying because no other radiator fan matches its performance and features at the price this device is offered. Also, it is the only 200mm case fan in this list. The diameter of the fan is 200mm. It rotates at 700 RPM. The noise produced by it is of 19 dB. It has a 3-pin connector system. It has RoHS compliance for protection of the environment. It has RGB LED lights present. It has a much bigger size than the other fans on this list which surely adds up to the overall performance provided by the radiator fan. The noise produced is so much lesser than the other fans which you would get in this price bracket and even in the price brackets higher than this. It is available in color options and yes it does follow the latest trends of RGB LED lights in computer systems. It is RoHS compliant. So, safety of the environment is taken care of. You get all these useful features at such low price. Cooler Master has definitely taken care of honest pricing and customer satisfaction. It only comes with a 3-pin connector system but we cannot complain because of the low price. The rotation speed is low at 700 RPM, as compared to the other radiator fans. Now that you have already checked the latest and top rated radiator fans which support liquid cooling, it is time that you understand how to choose the best radiator fan for your cabinet. PWM stands for Pulse Width Modulation. It means, that you can control the speed of the fan using an integrated circuit. The speed changes depending on the inner temperature of the cabinet. To use the feature, you would have to use a motherboard that supports a PWM header. Once that, you can use software to control the functioning of the fan. Compared to normal DC voltage fans, they run on 100% capacity but you still can control the speed of the normal fan using the BIOS. Though, you cannot really control the speed on the basis of inner component temperature like the PWM fans. For connecting to a motherboard, the radiator fans would either have a 3-pin or a 4-pin socket. The difference between the two is the same as normal and PWM fans. The 3-pin connection helps in running the radiator fan at a designated speed. You can alter it using the system BIOS or any third party software. The 4-pin is available in PWN radiator fans. It helps in altering the speed of the fan depending on the cabinet temperature. Note: You should check the slot in your motherboard. If it has the 4-pin option, we would recommend that you go with a PWN radiator fan as it consumes less power in the long run. Before buying a radiator fan, you would need to check your ATX case/cabinet for its compatibility. Depending on the space and size of your ATX case, you can use fans of sizes- 120mm, 140mm, 200mm etc. 120 mm: It is a standard size which is found in almost all new style cases. 140 mm: It is found in both new as well as old style cases. 200 mm: It is the biggest fan size. Ideally, your fan shouldn’t make noise over 50 dBA. Above that, you would certainly notice the sound in a silent environment. Though, when you are overclocking, the sound can go as high as 130-150 dBA. CORSAIR HYDRO Series H150i is a great radiator fan that supports great airflow with stunning RGB lighting. A little expensive but it also offers a complete package of an unmatched performance along with style and durability. Choosing a perfect radiator fan is not so easy just like going for a perfect RAM or gaming sound card. The reason why we prepared this detailed guide was to help people like you to make a wise choice and not just fall for visual traps (LED lighting and fan design). Keeping a check on the performance is must and can’t be avoided. At the end, you would want your PC to work fast without any glitches. That seamless design or LED lights won’t help you achieve that. You need to pay a lot of attention to the above details if you really want to purchase the best of the best radiator fan case. We hope, this post must have helped you gain a lot of insights about radiator fans and how to choose the best one. Do share your views in the comments section below. We would be happy to know your views. Nice article! The details are well put as if it is a tech forum. 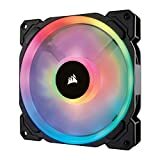 I was looking for a good 140mm fan. I guess I have finally found once after reading this post. PWM is not required to control fan speed. You use a voltage-based fan controller to lower the voltage and reduce fan speed. Thanks for sharing your thoughts. We just wanted to present a basic difference between the PWM and normal case fans.